GBP/JPY carving out a bottom? This morning saw European equity indices fall sharply with the DAX hitting a new multi-month low, before bouncing back noticeably. Risk assets were once again hit amid rising trade tensions. This followed reports that China is asking the Wold Trade Organisation (WTO) to authorise trade sanctions on the US. In FX, the GBP/USD dumped below 1.3000 in what looked like a mini flash crash. Bizarrely, this came just after the release of solid-looking UK wages data. According to the ONS, average earnings excluding bonuses rose 2.9% in three months to July on a year-over-year basis. This beat expectations for 2.8% and last month’s print of 2.7% last. Including bonuses, earnings rose 2.6%, which was likewise above expectations and the previous print of 2.4% respectively. The euro also gave up its earlier gains and fell back to $1.1580 from a high of almost $1.1650 earlier. The US dollar was showing strength across the board following yesterday’s brief pause. There were tentative signs that appetite for risk was improving with safe haven Japanese yen falling for the third consecutive day against the dollar. It remains to be seen however, whether there will be any follow-through now, as sentiment remains cagey following last week’s drop in US equity indices. 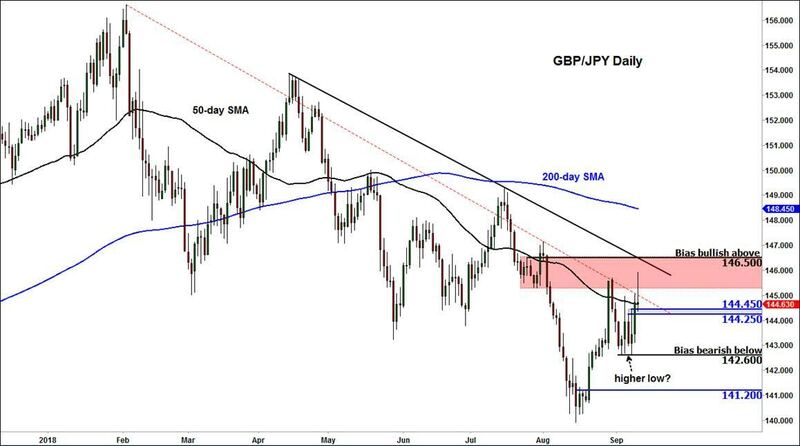 One particular risk-sensitive currency pair to watch for a potential reversal is the GBP/JPY. Not only are we seeing some positive headlines regarding Brexit, but UK data is also showing signs of improving again of late. With the Bank of England meeting coming up on Thursday, the pound could find further strength in the event the BoE hints at the prospects of further rate hikes in the months ahead. What’s more, the equity market sell-off looks to be a little overdone, especially in Europe. In Japan, the Nikkei closed sharply higher overnight, potentially pointing to calmer conditions there. So, if equity indices do manage to turn around here then the GBP/JPY could stand to benefit. Conversely, if risk aversion were to rise further then the yen could remain supported and this may keep the pressure on the GBP/JPY. In any event, we are going to let the market tell us which direction it is headed. If the GBP/JPY were to break through key resistance in the 145.50 to 146.50 range then this would be the bullish development we are looking for. For if this happens, price will have not only broken through horizontal resistance but through a bearish trend too and made a higher high on a closing basis. The GBP/JPY has already formed a potential higher low around 142.60. But if the selling pressure prevails and price falls below that low at 142.60, then this would invalidate any short-term bullish bias that may have been formed following recent price action.